The Daily Mail has decided to come out in support of Marine Le Pen’s bid to win the French presidency. But does the Daily Mail, I wonder, realise it is actually supporting the leader of not just a far-right party – but an actual fascist party? The real 1930’s, Hitler and Mussolini, goose-stepping, concentration camp thing. Ms Le Pen is the leader of the French far-right party Le Front National, whose co-founder, along with Ms Le Pen’s father Jean-Marie Le Pen, was a man called Roland Gaucher – who actually served time in prison for collaborationism during the Nazi occupation of France. And Ms Le Pen’s father himself also did much to polish up his fascist credentials by infamously describing the holocaust as a ‘detail’ of history. Of course it’s possible the Daily Mail just made a mistake – maybe they didn’t research the origins of Ms Le Pen’s party well enough – maybe they didn’t know about her father’s opinion on the Holocaust or maybe they just thought the sins of the father should not be visited on the daughter. Except for the fact this isn’t the first time the Daily Mail has come out in support of a fascist party. In January 1934, the Daily Mail printed an article entitled “Hurrah for the Blackshirts“ supporting Oswald Mosley and the British Union of Fascists. 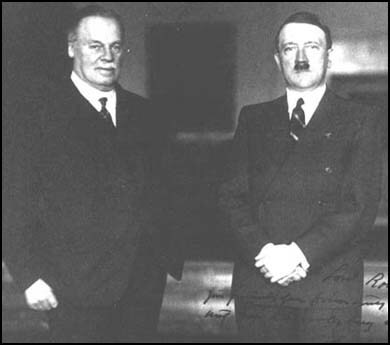 In the article, the Daily Mail owner Lord Rothmere praised Mosley for his “sound, commonsense, Conservative doctrine”. The minor misdeeds of individual Nazis would be submerged by the immense benefits the new regime is already bestowing on Germany. Lord Rothermere, Daily Mail, 1933. Rothermere’s grandson, Viscount Rothermere – a tax exile and Conservative Party supporter – is currently Chairman of the Daily Mail and General Trust plc – the present-day owners of the Daily Mail. So it does seem hard to put it down to judgement of error, doesn’t it? To support one fascist party may be regarded as a misfortune; to support two looks like – collaboration?